Taskade is a to-do list tool that combines collaboration with a variety of document templates to help you get things done together. It functions similarly to how Google Wave worked when it debuted, with a blank document and a chat section off to the side. Taskade allows you to divide all your documents up into groups, which can then be accessed by those you invite directly or by sharing your invite link with them to preview the document. By de-coupling the chat interface from the document, you can better communicate with changes and tasks that need to be performed. The service is available as an app for iOS, Android, and the web, but it is also available as a Chrome & Firefox browser extension, so you see all of your documents on your new tab page for easy access. Taskade also provides a robust list of template documents to help organize your thoughts based on the project you are performing. Some of the basic templates include weekly tasks, a project roadmap, brainstorming, meeting notes, project overview, and a reading list. If none of these templates suits your needs, you can create your template that you can save for future documents for your groups. The editing tools are robust and feature the ability to highlight lines in five different colors with a wide variety of emojis to make your tasks and to-dos stand out. There are even a few customization options for the unlimited intents, including dots, squares, and triangles. You can also customize the checkboxes to be circles, squares, or hearts. Individual document groups can be customized with hex colors or a handful of pre-approved photo backgrounds. There’s no option to upload your photos for a custom background, but Taskade does give you light and dark themes so you can reduce eye strain when working at night. 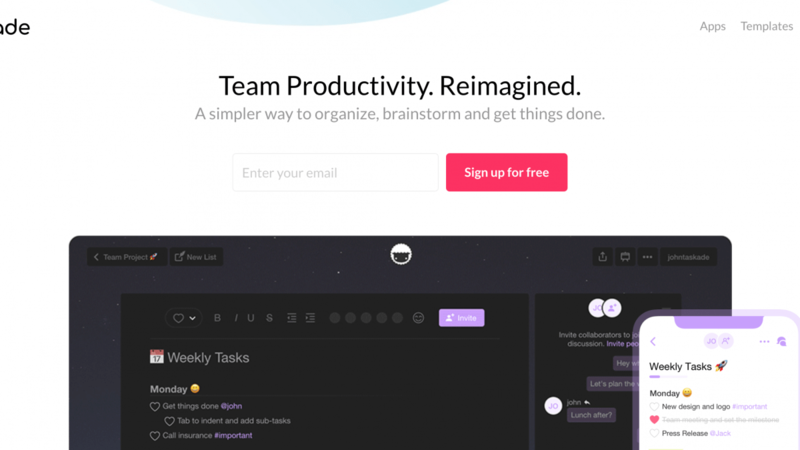 Overall, Taskade is an impressive free tool for online collaboration with others, even if the feature set is a bit limited. Currently, it does not look like there’s any proper versioning system in place, so you cannot go back to a previous version of a document if significant changes have been made. Despite this, it is still one of the best options for organizing your life with others online.